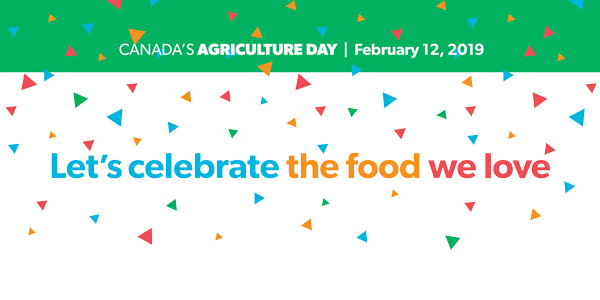 Canada’s Agriculture Day takes place across Canada on February 12, 2019! It’s a day when everyone can come together to celebrate the business of Canadian agriculture. Get involved with an event in your community – or plan your own activity! CFA is proud to be a contributing partner to Agriculture More Than Ever’s Canada Agriculture Day event in Ottawa, an all-day conference on February 12th which will feature a top-notch line-up of speakers including CFA President Ron Bonnett. The event will conclude with a reception celebrating food from all across the country — a great occasion to meet people from agricultural organizations across Canada while sampling great Canadian food. Register today! It’s time to showcase all the amazing things happening in the industry and create a closer connection between consumers, our food and the people who produce it. How will you celebrate Canada’s Agriculture Day? Visit www.CdnAgDay.ca today! You’ll find inspiring ideas for organizing local activities as well as plenty of merchandising items available for order. Be sure to register your event as part of the national roster of Ag Day activities. Get the word out on your Canada’s Agriculture Day event with the #CdnAgDay hashtag on Twitter.